In 1942 during the early planning stages for the invasion of Europe, it was realised that large numbers of main line and shunting locomotives would have to be built and used on both British and European lines. Riddles was put in charge of the design work, and produced this 'WD Austerity 0-6-0ST' design to meet the projected shunting needs. The first locomotive was steamed in January 1943, and a total of 377 were built for the War Department over the next four years. In 1944, a number were loaned to the Ministry of Fuel and Power for working various open cast coal sites. The railway companies were given the responsibility of maintaining these locomotives, and the LNER became responsible for twenty-five of these engines in January 1945. Soon, one would be loaned to the LNER and formal trials began in November 1945. The design proved to be rugged and simple, and the LNER purchased 75 locomotives and gave them the classification of J94. The order was placed in May 1946 and most were quickly delivered in June and July of 1946. With the shortage of materials in post-War Britain, the purchase of the J94s was clearly preferable to building new J50s for the LNER's heavy shunting requirements. As time was important, Riddles adapted the standard Hunslet 18in inside cylinder industrial 0-6-0ST, incorporating a variety of austerity features. They were not intended to last very long, so modifications were intended to reduce production time and costs. Attempts were made to reduce the number of required steel castings. The wheel centres were cast iron, and the frames were welded steel plate. The slide valves were also cast iron, and had valve chests located between the cylinders. The boiler was constructed from two rings and fitted with a round-topped firebox. The firebox had an inner copper shell, and was fitted with two Ross pop safety valves. A large welded saddletank was fitted. On the 75 J94s, 29 were already in service with the military in Britain, 40 were new (typically in storage), and the remaining 6 were still under construction by Andrew Barclay &Co. The military engines needed urgent repairs, and the stored locomotives were reputedly almost as bad. The most common problems were over-heated bearings. A typically bad example was No. 8074 (WD No. 71535) which broke down at Immingham in July 1946. It was returned to Andrew Barclay as a 'light repair' and was not returned until January 1948. The LNER also had to modify the J94s to meet its needs. These modifications included new cab seats, cab side doors, and LNER standard lamp irons. These were minor enough to be handled by the sheds. A couple of J94s had their coal bunkers extended in 1947. A ladder, steps, and rear cab windows were also fitted at the same time. British Railways would convert a number of other J94s between 1948 and 1951, but many would remain unchanged. The J94s were initially allocated to Immingham (25), Gorton (5), Blaydon (11), Darlington (12), Newport (3), Selby (3), West Hartlepool (5), and York (11). Transfers to Scarborough and Sunderland occurred before Nationalisation (1948). British Railways (BR) would transfer them over a wider area, and they would be seen at many other sheds including Ardsley, Bidston, Birkenhead, Borough Gardens, Boston, Colwick, Consett, Dairycoates, Gateshead, Goole, Heaton, Hexham, Hornsey, King's Cross, Langwith, Mexborough, Retford, Stockton, Thornaby, Trafford Park, Tyne Dock, Westhouses, and Wrexham. As well as shunting small yards, the J94s proved to be ideal for short distance trip workings. The J94s proved to be particularly useful on 'difficult' branch lines such as the Brymbo branch in North Wales and the East & West Yorkshire Union line (E&WYUR). Their most famous workings of this nature, were on the Cromford and High Peak line in the BR's London-Midland Region. Three J94s were allocated to the line in 1956. One engine was based at Cromford and made transfer trips between High Peak Junction and the bottom of the incline. The other two were based at Middleton Top and operated workings to Friden and Parsley Hay. By 1962, four further J94s had been allocated to the Cromford and High Peak. Withdrawals started in 1960. The last two J94s were withdrawn in 1967 after the last section of the Cromford and High Peak line was closed. A total of six of the J94s were sold to the coal industry between 1963 and 1965. Some of the J94s were fitted with 3 ton coal bunkers. These extended bunkers increased the full weight to 49t 2cwt. Heating Surface: Total: 960.0 sq.ft. Two of the original LNER J94s have survived into preservation. No. 68077 is in operating condition at the Keighley & Worth Valley Railway. No. 68078 has also been preserved and can be found at the Kent & East Sussex Railway. Note that the J94s were used in large numbers by heavy industry during the 1950s. Most were withdrawn during the 1970s, but a few survived into the early 1980s. This fortuitous timing has proved useful for the preservation movement which has found them ideal for hauling small passenger trains. Many ex-industry J94s have survived into preservation. A few have been given LNER or BR liveries with the numbers of scrapped J94s. One such example is No. 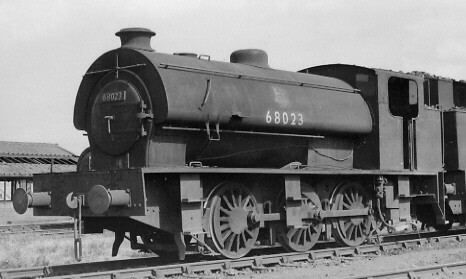 68011 which has also been given the name Errol Lonsdale. It is currently located on the South Devon Railway. The J94 was produced by Graham Farish in a number of liveries including that of BR and the NCB. Bachmann have recently re-introduced this model as LNER No. 8051 and BR No. 68051. This also features a chassis which runs much better that previously. Hornby sell a ready-to-run model for OO gauge (4mm scale). Bachmann have also produced a brass model of the J94 for both O gauge (7mm scale) and Gauge 1. Meteor Models also sell a kit of the J94 for O gauge. GRS (Prince Risborough, Bucks.) sell a brass J94 for Gauge 3 (G-64). Thank you to the P.H. Groom collection for permission to use the above photograph of BR No. 68023.